Milton Complete Protection Sterilising Fluid is used to sterilise breast feeding equipment and all babies feeding utensils, including bottles, soothers, teething rings, small plastic toys and weaning items. Milton Complete Protection Sterilising Fluid allows you to sterilise in 15 minutes. The solution is harmless and leaves no unpleasant taste or odour, so there is no need to rinse after use - utensils are safe for your baby to use immediately. Follow the 3-step method to sterilise breastfeeding equipment and all babies feeding utensils, including bottles, soothers, teething rings, small plastic toys and wearing items. Ideal at home to protect your family. 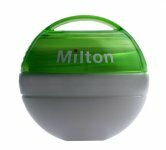 Use the Milton fluid to sterilise or disinfect all non-metallic surfaces and items, e.g. : Nursery hygiene (highchairs, wooden and plastic toys, bibs, changing mats, baby baths etc), Kitchen hygiene (work surfaces, cupboards, chopping boards, fridges, soaking cups/glasses etc), Food safe, Food hygiene (soaking salads and vegetables), Camping and brewing hygiene. To make water safe for drinking, use half a teaspoon (2.5ml) of Milton Fluid to 5 litres of water and leave for 15 minutes. The Milton Sterilising Fluid allows you to sterilise in 15 minutes. 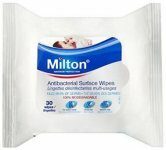 Milton has been sterilising babies untensils for over 50 years and is clinically proven to protect against all germs.